This baby boy had his newborn portrait session at his home in the South Hills of Pittsburgh. We don't tend to use props in our photography sessions often, however we were delighted to incorporate both mom and dad's special 'lovies' from when they were babies themselves, saved for this very moment! 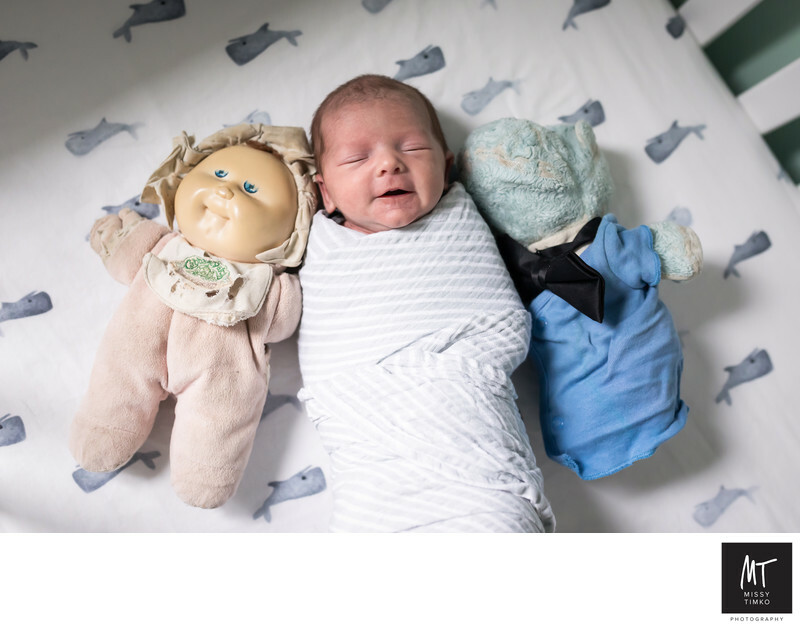 This made for such an unique, emotionally portrait of this newborn boy. Surrounded by the two very much loved objects than lay right next to his own mom and dad when they were babies, contrasting new and old. The goal during your newborn photography session is to help your baby feel calm & sleepy when it is portrait time. This works best of baby can try to get in a nice full feeding before I am scheduled to arrive (in-home sessions). Baby will most likely be ready for pictures at our session time, feeling calm, relaxed and ready for photos! Location: Mount Lebanon, Pittsburgh, PA 15228.